Nicki Minaj verbally bashed Mariah Carey during the American Idol auditions in Charlotte N.C. last night and she even threatened to “knock her out.” She gives her a verbal lashing complete with plenty of four letter words. Nicki knew this was going to happen apparently because she said to Randy Jackson “I told them I’m not f**kin’ putting up with her f**king highness over there,” referring to Mariah. “Nicki Get this s**t in self control. Get in control. Get in control. Nicki Don’t lose your head. Don’t lose your head (inaudible). Don’t tell me I’m a gangster. Nicki (inaudible) every 5 minutes. So every time you patronize me, I’m-ma take it back, and if you’ve got a f**king problem, handle it. Nicki I told them I’m not f**kin’ putting up with her f**king highness over there. Figure it the f**k out. Figure it out. This was the dialog caught on tape, it was after the cameras stopped rolling when Nicki threatened to “knock out” Mariah. While Mariah didn’t sit idol and take this all in, you can’t hear on the video what her comeback was to Nicki’s rage. She obviously had something to say, but whether she fueled the fire or not, it’s hard to say. Nicki did mention “don’t tell me I’m a gangster,” so apparently someone referred to her as one. Talking like a gangster will often get you that tag Nicki. It seems the blow-up has the producers worried, as this is just the beginning of the diva’s career together. They stopped the auditions for the day to let the ladies cool their heels. There was nothing tame about this outburst and with Nicki and Mariah looking at a long haul on the judges panel, this has the higher powers of the show pondering how to put a lid on future conflicts. This is like asking angry bees not to sting, as you have the new diva meeting the old diva of pop music. This battle started over a disagreement of a contestant’s talent. Apparently the two diva judges had different takes on how this contestant performed. One like them and the other didn’t, but it is not known who took what stand. The jealousy factor is sure to play into this as Mariah, who has been around for a while, prides herself of having years of experience under her belt. Nicki, who is in the know of what today’s music listeners like, might think she’s more in tune with the times. It’s a battle of the old against the new! 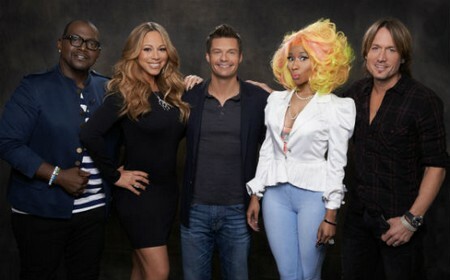 American Idol’s Nicki Minaj and Mariah Carey At War Already – Who Is The Biggest Diva In The Land?